Title: 06/11/1987 - HMIS for meeting labeling requirements of the HCS. This is in response to your letter of May 15 regarding the National Paint and Coating Association's (NPCA) Hazardous Material Information System (HMIS). The Occupational Safety and Health Administration (OSHA) does not and cannot endorse any product. Although NPCA has submitted their health effects labeling approach for review, our evaluation will not result in an endorsement. Rather, the Agency will indicate to NPCA whether we believe compliance with the Hazard Communication Standard can be met by using their "approach." The mention of the HMIS labeling system in the preamble to the standard was used as an example, along with the American National Standards Institute voluntary compliance standard on labeling, to illustrate that many of the existing labeling systems could continue to be used to meet the performance-oriented language of the Hazard Communication Standard. Our intent has never been to exclude other types of labeling systems. OSHA has never indicated that the mentioning of NPCA's labeling system in the preamble was a mistake. However, there was a change in policy in regard to the use of labeling systems such as HMIS which communicates the severity of the hazard by means of a numerical rating system. In OSHA Instruction CPL 2-2.38A, dated May 16, 1986, the Agency stated that labeling systems like HMIS could only be used when additional warnings indicating the effects of exposure are added to the label. 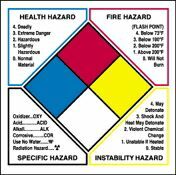 This policy was changed in our July 18, 1986, update to the instruction, which stated that a labeling system was permitted as long as the entire Hazard Communication Program is effective. An effective program is one that ensures that employees are aware of the hazardous effects of the chemicals they are potentially exposed to as well as meeting the other basic requirements of the standard. I hope your concerns have been answered. If I can be of further assistance, please feel free to contact me again.